The Venezuelan military has launched large-scale drills to bolster its combat readiness after the US threatened that it could use military force to oust the elected government of President Nicolas Maduro. According to Press TV, Madruo traveled to the Central State of Miranda on Sunday to inspect the troops and military equipment stationed there and attend the opening ceremony of the maneuvers, which will be held across the country and will last until February 15. Addressing thousands of soldiers at a camp, the president said the war games will be the “most important” drills in the country’s 200-year history. The Armed forces “must prepare to defend [Venezuela’s] sovereignty, territorial integrity, [and] independence,” Maduro said. The maneuvers come amid a political crisis, which saw the US-backed opposition Leader, Juan Guaido, abruptly declare himself “interim president” last month. The administration of US President Donald Trump hastily declared support for Guaido, announced sanctions on Venezuela’s oil industry and said sending military forces to the country was “an option” to push for the Maduro government’s ouster. 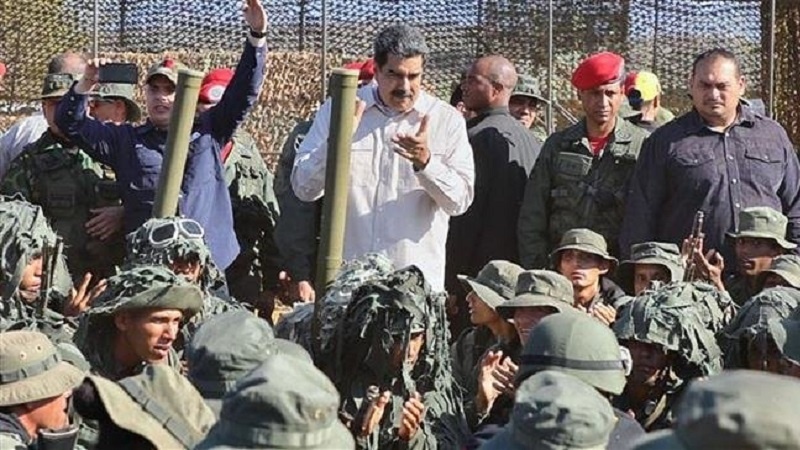 Guaido and the US have also been encouraging members of the Venezuelan Armed Forces to abandon the legitimate government and join the opposition camp, which has also the support of Washington’s European and Latin American allies. Maduro’s Foreign Minister Jorge Arreaza also told Iran’s Spanish-language HispanTV that his country was prepared for any possible scenario. “Our Armed Forces are prepared. We have a professional army of more than 200,000 personnel. We have an additional 2,000,000-plus paramilitary force… We are prepared for any scenario,” he said. Guaido has not ruled out that he could take a “controversial” decision to “authorize” a “humanitarian” intervention into Venezuela. “Only the US Congress can do that. We will not,” he said in a tweet on Saturday.